PRESIDENT D. Medvedev INTRODUCED THE CANDIDATURE OF V. PUTIN TO THE POST OF PRIME MINISTER ON MAY 8, 2008 IN THE STAT DUMA. THE SPEECH OF V.V. Putin, CANDIDATE FOR THE POST OF PRIME MINISTER OF THE RUSSIAN FEDERATION, BEFORE THE STATE DUMA. Cherny V.V. 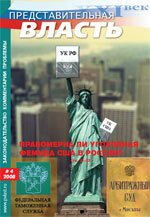 Is American Criminal Justice Applicable in Russia? Pepelyayev S.G. HAS LIFE GOTTEN BETTER?